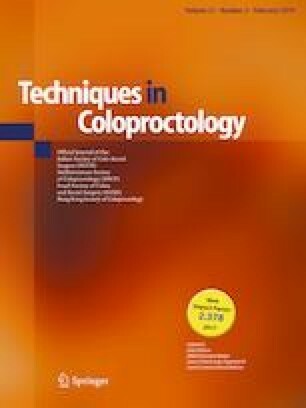 Nowadays, laparoscopic colorectal resection is gaining widespread popularity because it is associated with less blood loss, quicker recovery, and shorter hospitalization than open surgery as well as equivalent oncological benefits. In laparoscopic surgery, bowel transection and reconstruction are very important for oncological efficacy and surgical safety, especially avoidance of anastomotic leakage (AL). Although multiple factors such as total mesorectal excision (TME) surgery, low anastomosis, preoperative chemoradiation, advanced tumor stage, and multiple firings of the linear stapler are proven to increase the risk of postoperative AL, the technical aspect of colorectal transection and anastomosis is the dominant contributing factor . The online version of this article ( https://doi.org/10.1007/s10151-019-01982-3) contains supplementary material, which is available to authorized users. This work was supported by the Science and Technology Support Program of the Science and Technology Department of Sichuan Province (Grant number: 2016SZ0043). We acknowledge Yan Yan (School of Life Sciences, Chinese University of Hong Kong), who helped prepare the video. The procedure of the study involving human participant was in accordance with the 1964 Helsinki declaration and its later amendments or comparable ethical standards. Informed consent was obtained from each patient included in the study.